Here's a 'clean and simple' Christmas card. 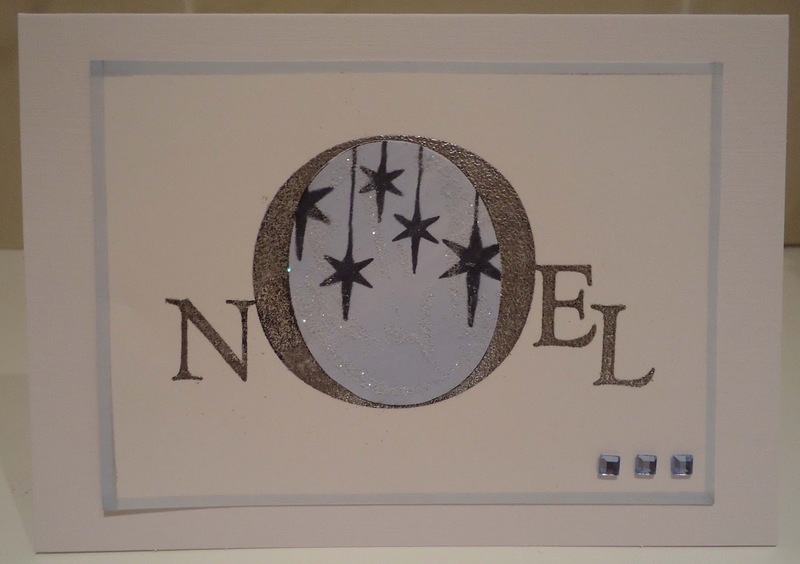 The Noel is a Clarity stamp and the hanging stars were a free stamp with Craft Stamper magazine. 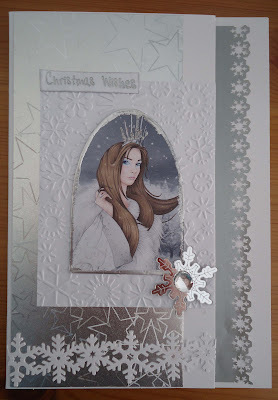 I used silver embossing powder, glamour dust (for sparkle on the stars circle) , a pale blue Promarker, 3 square gems and that's it! 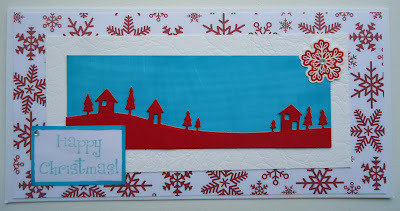 Christmas Stampin all year long Circle (I hope the o qualifies). This mermaid looks a bit of a minx, doesn't she? 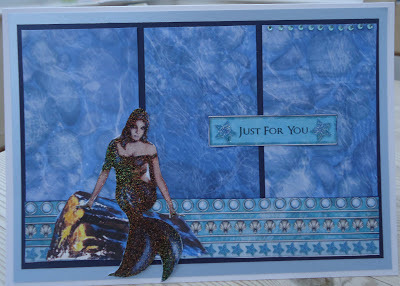 The papers and mermaid were from Debbi Moore Under the Sea CD and the rock is from My Craft Studio 'Setting the Scene'. 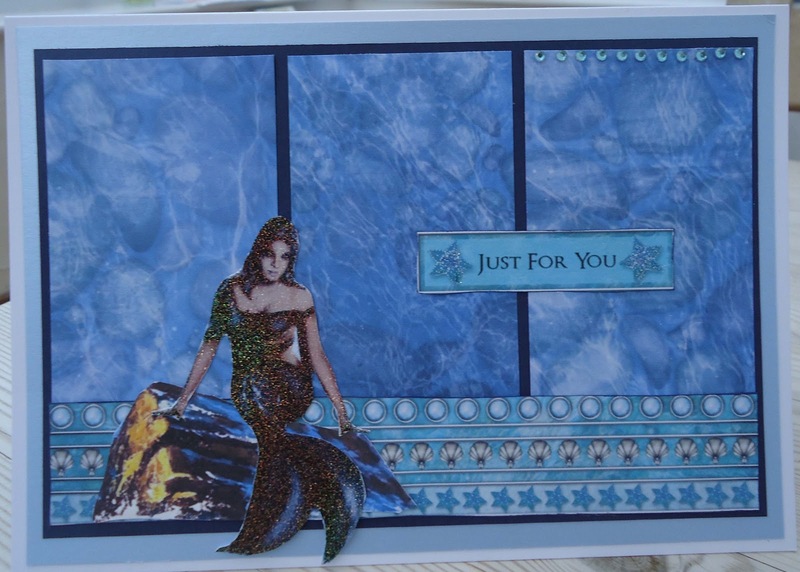 I heat embossed the mermaid in holographic ep and added a row of gems at the top and some fine glitter to the sentiment. Calamity crafter strikes again! 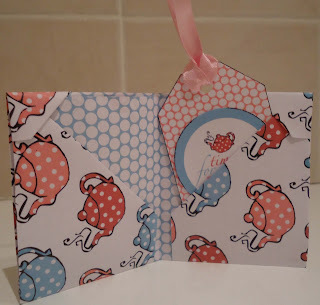 I was just about to stand this card up to photograph it , when I found I was unable to open it as I'd stuck one end of the ribbon to the back of the card! Doh. Luckily managed to peel and re-stick. 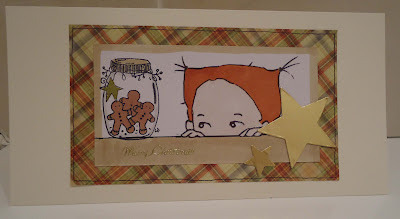 The central image is an oldie-but-gooodie um rubber stamp from Frantic Stamper. I stamped it in black, cut it out and coloured in bits of it with a pink promarker. The shaped paper behind it is part of Craftwork free sheet from a magazine. 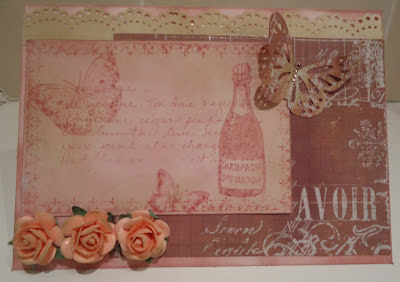 I coated a Cuttlebug embossing folder with Vintage Pink Distress Ink and embossed a scrap of pink card. I also dabbed the rose with the Vintage Pink ink. 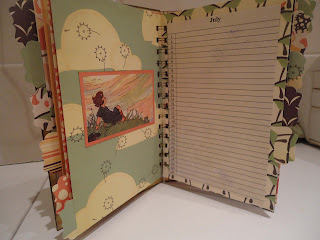 This is my second Bind-it-all project and, to be honest, it's still a struggle! This has taken me all day! 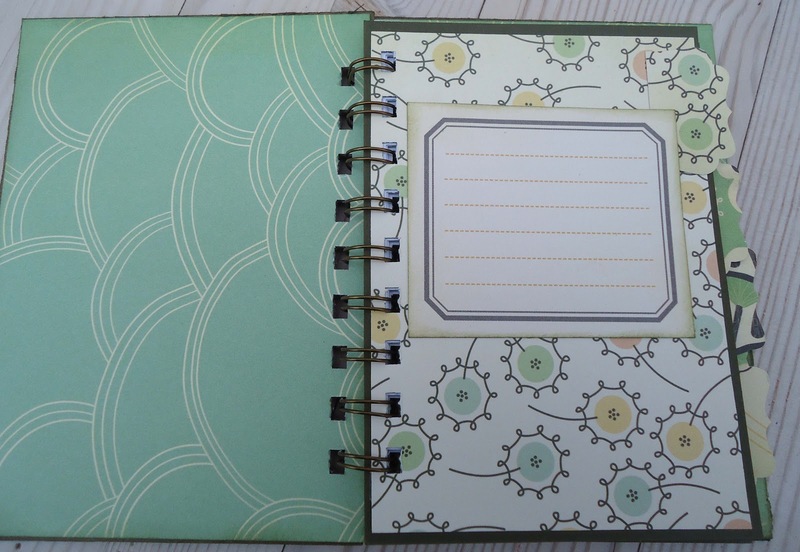 You can see in the second photo that the inner pages are not perfectly centred. 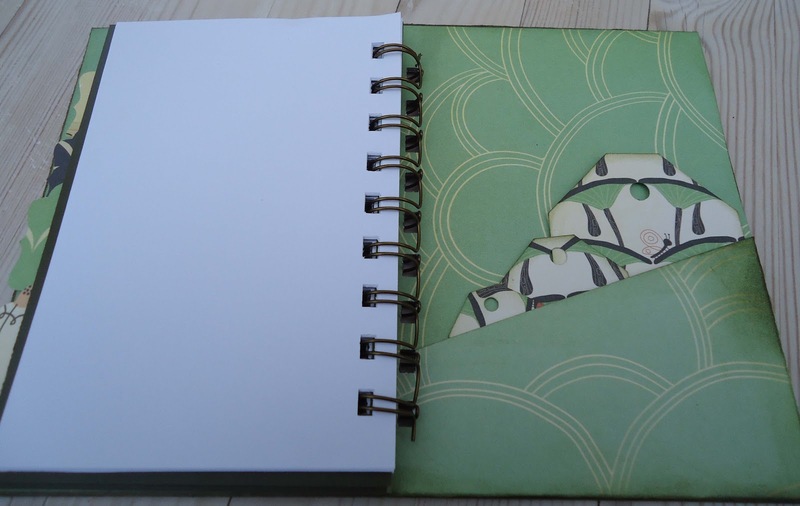 It was worse before - I'd entirely cut the wrong size pages for the covers (in bind-it-all terms), so I had to recut all the white sheets and make the index pages bigger by backing them onto olive cardstock (which actually turned out okay, I think). It's working in 16ths of an inch that's doing my head in - I didn't realise how lovely metric is! This is a little present for my best friend. It's not very embellished, as she doesn't like fussy things, but she does like 50s prints and I think these papers are reminiscent of those. They're the same papers (Cosmo Cricket) that I used for my first (traumatic) Bind-it-all project, so I've done pretty well out of them. 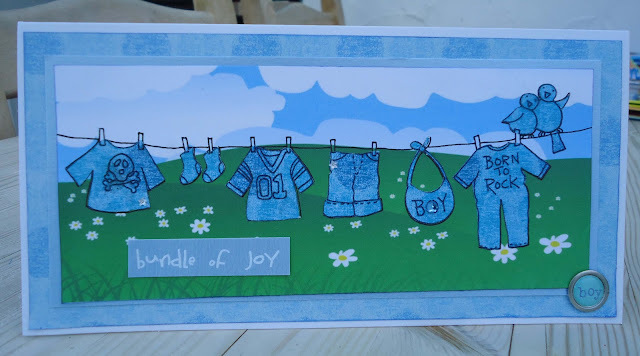 This is a new baby card for someone who's been told she is having a boy. I thought, because of scanning, that gender predictions were pretty foolproof now. But recently my daughter, a student midwife, was at the birth of a baby who was the opposite gender to what the parents had been told!! 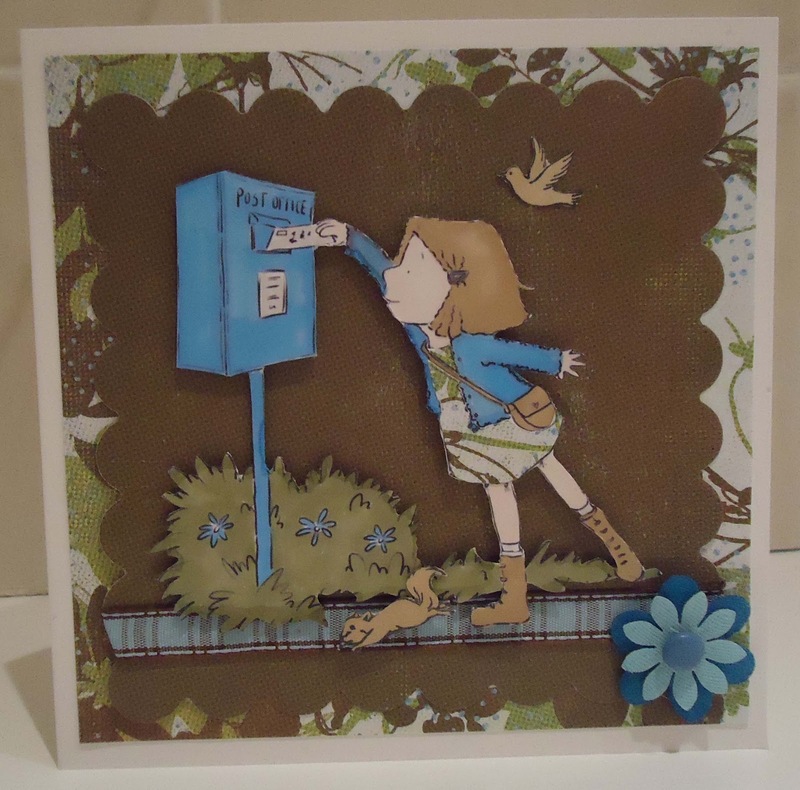 The idyllic background was printed from a My Craft Studio CD and the washing line is a digi from Dearie Dolls. I paper-pieced the washing and the 'bundle of joy' sentiment is a rub-on. 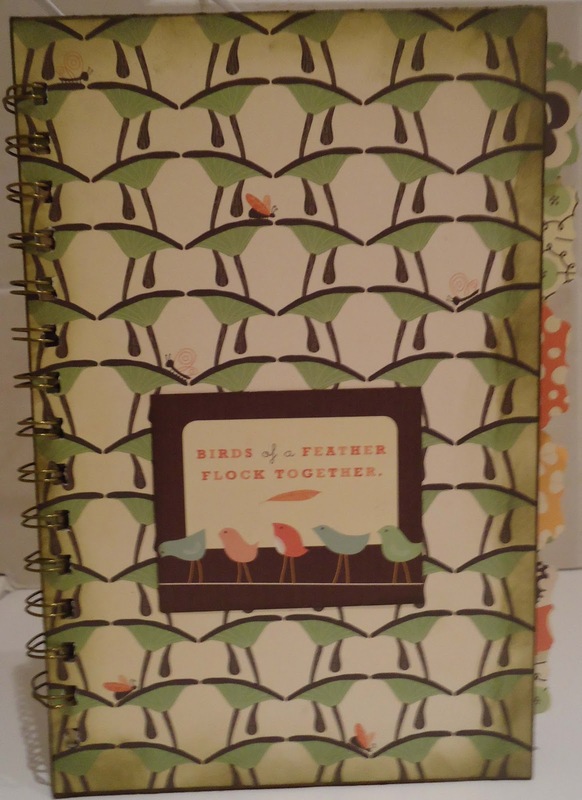 Years ago, when you couldn't just look things up on the internet, I used to have a little notebook where I copied down my favourite poems. This week's challenge at CD Sunday (Poetry Corner) made me think of revisiting this idea, but this time with all the advantages of digital crafting. This is probably the most digital project I've ever done - it was all made in Craft Artist, printed off and stuck onto some 8 x8 cardstock. 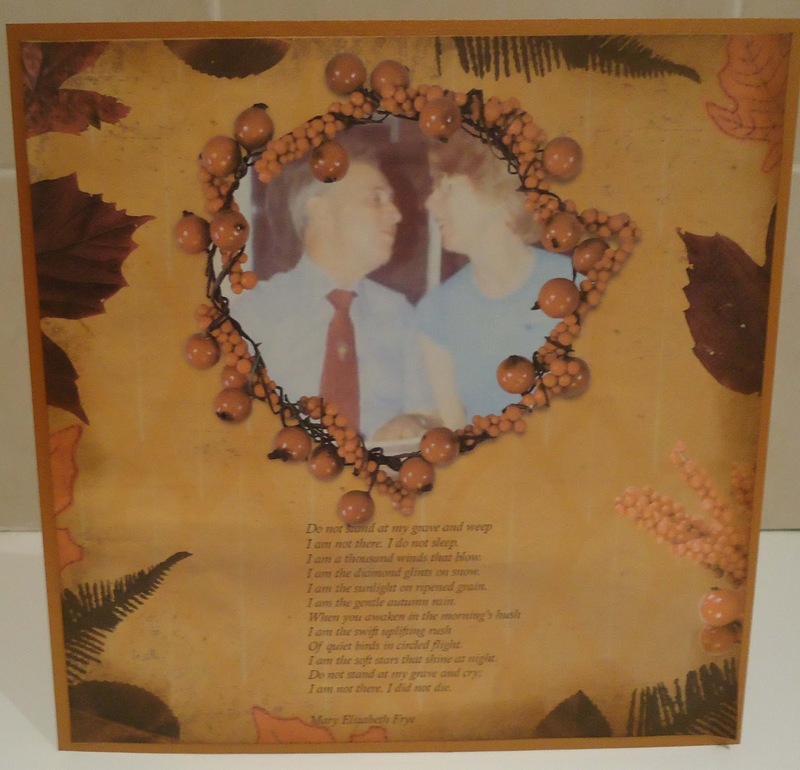 The photo is of my parents, who died in 2001 (dad) and earlier this year (mum), and I know that, like me, many people find this poem very touching. 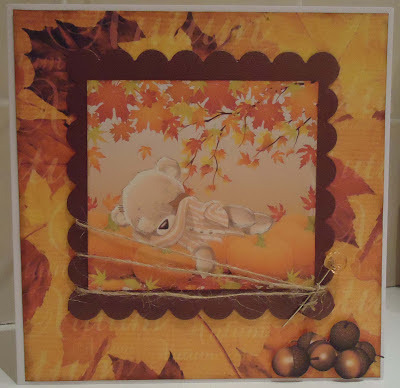 As well as CD Sunday, I'd also like to enter this for the 'anything but a card in autumn colours' challenge at Quirky Crafts. The central image if this card may be small, but I have used four stamps on it! 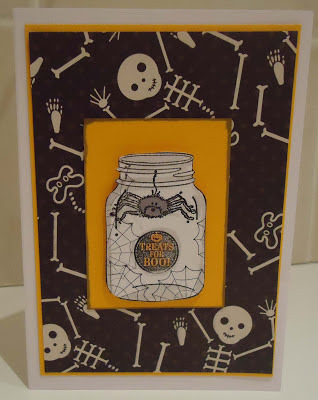 The jar is from Stampin Up 'Perfectly Preserved' set and the 'Treats for Boo' and cobweb stamps are from Stampin Up hostess set , 'Mixed Medley'. The spider is from a Daisy and Dandelion Halloween set. 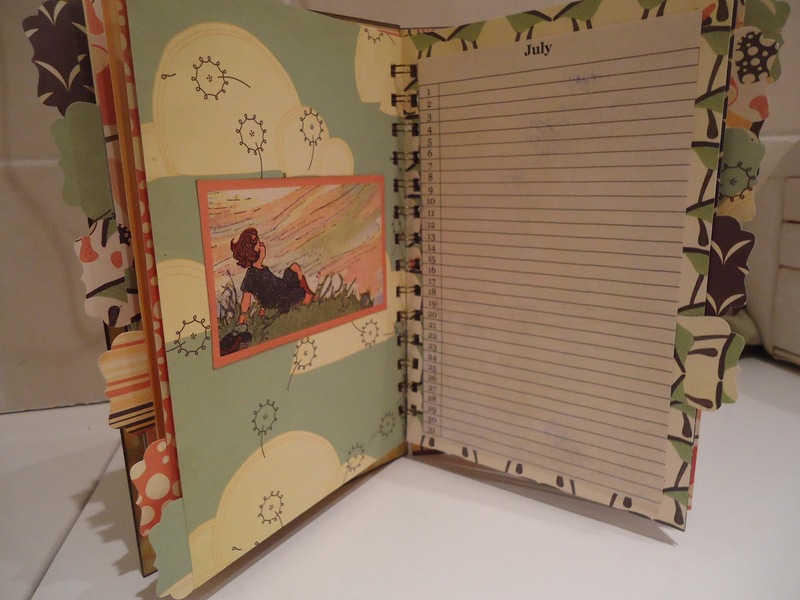 The paper is from Making Memories. I bought a Bind-it-all , secondhand from Ebay and this is my first project. 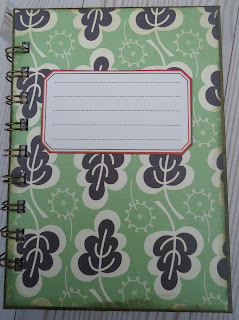 It is a birthday book and I used Cosmo Cricket Earth Love papers,which I love. The calendars were a free printable from Cat's Creations. 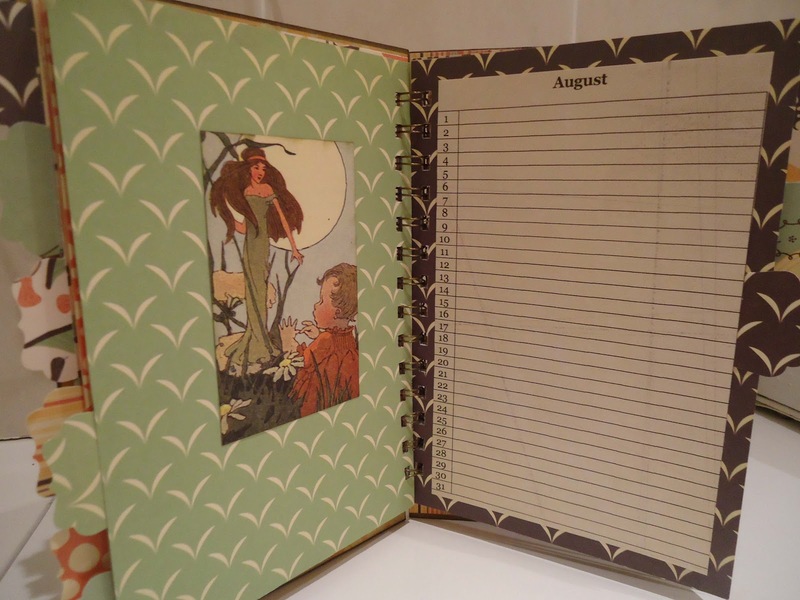 I always intended to keep this book for myself - which is just as well, as I made a few mistakes with the binding. I'm thinking though of perfecting my technique to make some books for gifts. 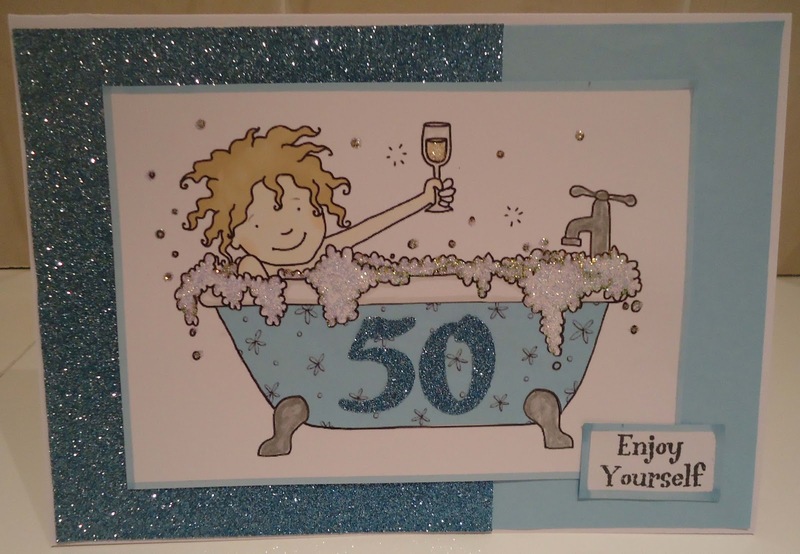 It's my friend's 50th birthday next week, so this card is for her. The image is by Jellypark, coloured with Promarkers. 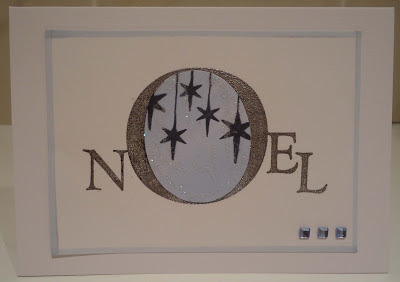 I cut the numbers from glitter paper using Sizzlit dies, and added copious amounts of glitter glue. Everything here ( except for cardstock, twine and the leaf-headed hatpin) , comes from My Craft Studio Cromford CD. Cromford is the bear: originally blue, but I recoloured him to make him look more harmonious! The sleeping bear was an individual image, but I lay him onto the pumpkins and added autumn leaves etc. I cut out the acorns and stuck them on with 3d foam. 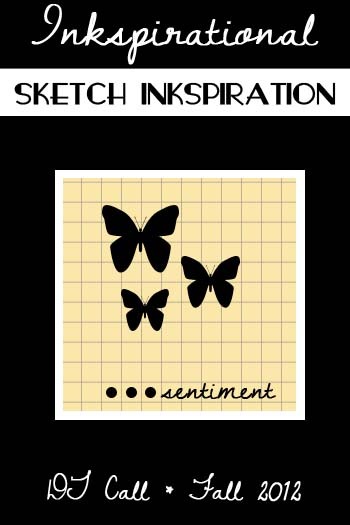 This is my fourth and final card for the Inkspirational DTcall. The challenge was to use the photo as inspiration. 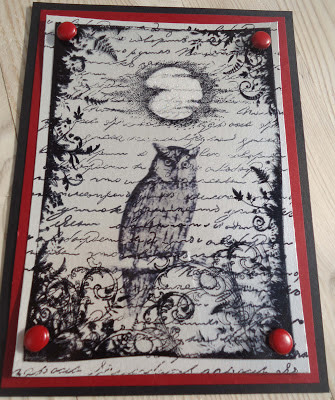 I have several owl stamps (rubber and digi) but they are all cute and I wanted something more realistic, so I download this owl from FreeVintage Digital Stamps. I printed it onto acetate and then stamped around it using Staz-on : moon (unknown UM) , frame ( Kanban),and flourish (Basic Grey) . I added Glamour Dust to the back of the moon. (I’ve done a close-up because it’s hard to see glitter in the photo!) . I stamped an Indigo Blu text stamp onto matt silver card and attached the acetate panel with brads. Sounds simple? It’s taken me hours ! There are several earlier attempts in the bin! I’ve really enjoyed rising to the challenge for the design team call. Even if I’m not picked for the DT, I know I’ll enjoy joining in with the new challenge blog when it gets going. Here's my third submission in my bid for the DT of the new Inkspirational challenge blog. I think I largely kept to the sketch, but I used the idea of a triangle of the same thing in decreasing size, and substituted the butterflies with lanterns. I stamped Bo Bunny lanern stamps onto black card and heat embossed in gold. 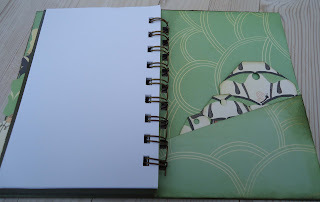 Then I paper pieced them in Japanese paper. I used a notch punch and embroidery thread to create a border. 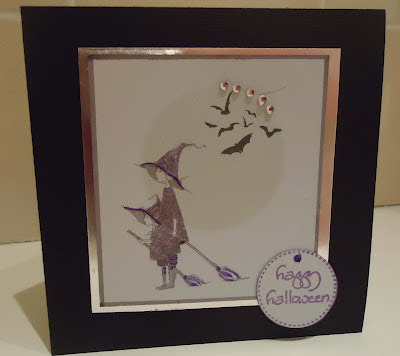 As well as the Inkspirational DT call, I'd also like to enter this for One Stop Craft Challenge 'heat embossing'. This is my second card for the design team call for Inkspirational. 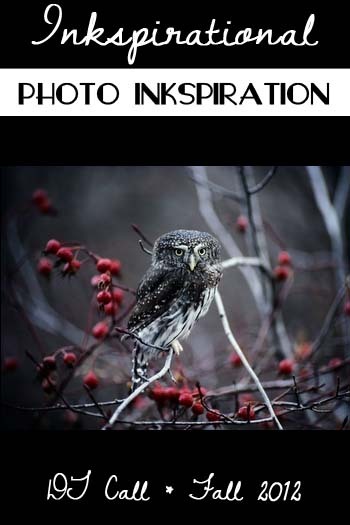 Looking at the card now, next to the colour inspiration picture, I'm not sure that the match is that great! ...Especially the blue, although the colour of Promarker I used was 'sky blue'. 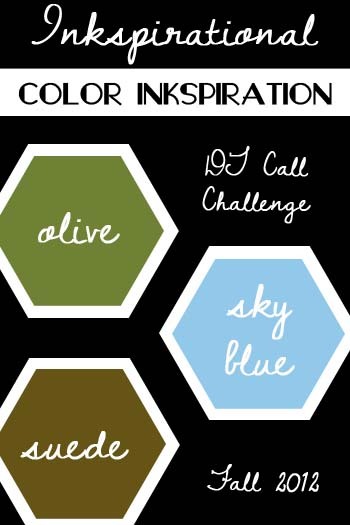 Never mind; the idea of the challenge is 'inspiration' and the colour palette made me think of the turn between summer and autumn - when the weather's still quite mild but you need a nice cardigan. This digi stamp from Jellypark seemed to capture that time, and I added a rubber stamped squirrel and bird (October Afternoon). Do you notice the paper-piecing on her dress? Paper-piecing is my favourite technique and I can't help but use it on any item of clothing!! Mynette is having a design team call for a new challenge blog. Mynette is very active in the crafty blog community . She is involved with several design teams and challenges but I’ve noticed that she also visits lots of other people’s blogs and leaves very kind and individual comments. I thought it would be fun (and a real challenge) to have a go. Here’s my first effort. 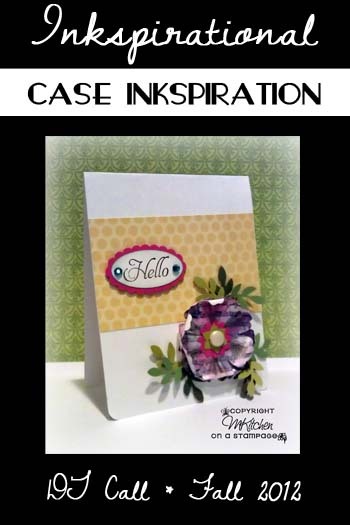 It’s a CASE of one of Mynette’s cards. I’ve never done a CASE before, and had to look up what it meant! I’ve tried to keep to the shape and proportions of the original card, while changing to theme to Christmas. I’ve never used this shape card base before, so made this one and rounded the bottom edges as on the original. 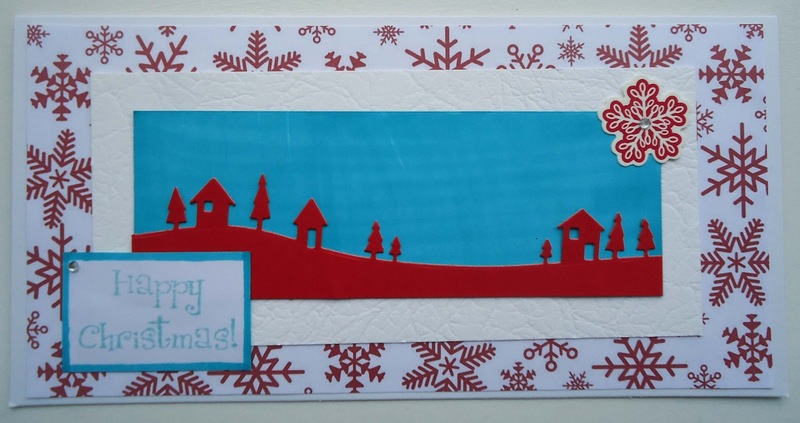 The paper is by Reminisce ( it reminds me of a Christmas sweater!). 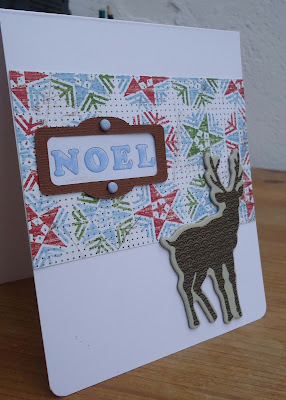 The bookplate is a Sizzix die and the deer embellishment is by Prima. I printed Noel from a Docrafts CD. 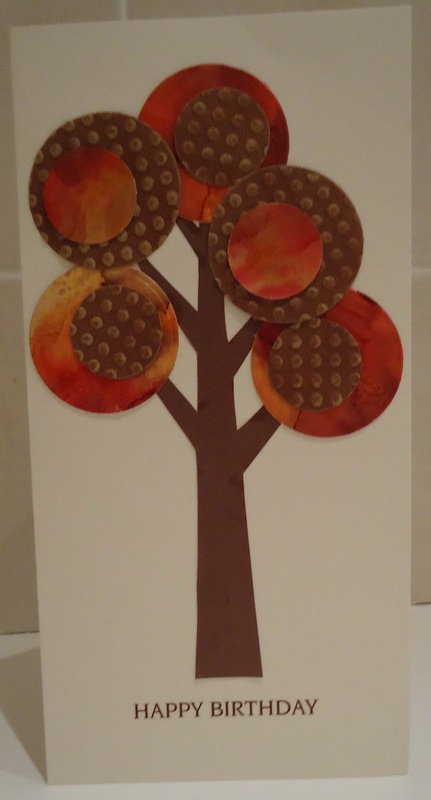 Am I overdoing the autumnal cards? Well, I do love the colours and I had a sheet of alcohol inked background that I'm now using on a third (and final) card! For this card I recoloured and printed off a bare tree digi stamp from Craft Artist and cut it out. 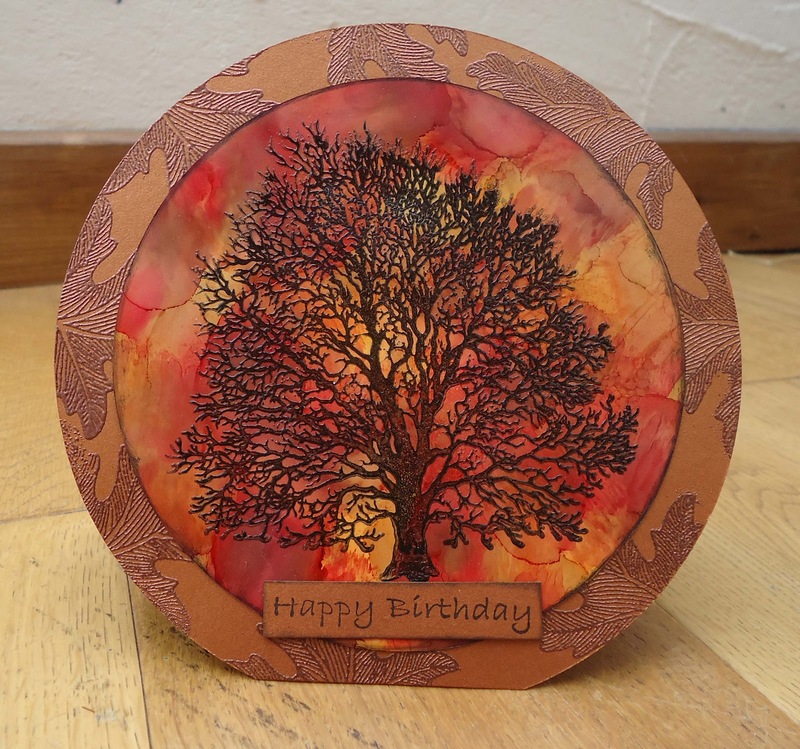 The leaves are die cut and punched circles from my alcohol ink background and from coredinations card that I embossed and sanded. The sentiment is a rub-on (brave, I know - they so often go wrong!) 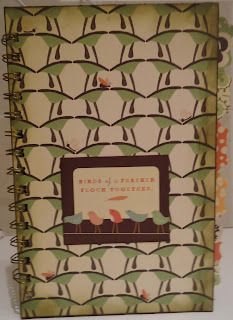 from a 3 Birds kit that I bought ages ago, on impulse, from the telly, and have barely used. A distressed steampunk card. The good thing about distressing is you don't have to worry about smudges - bring 'em on! 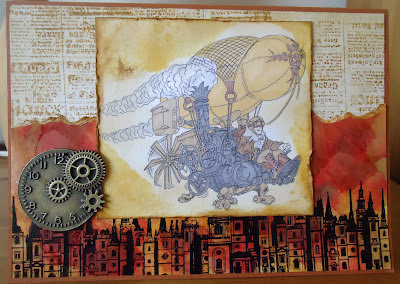 What I used: Flying Balloon digi stamp from Make it Crafty; buildings stamp(Crafty Individuals) ; newspaper (Glitz); Promarkers, Distress inks, alcohol inks, glimmer mist , distresser thingy , and the embellishment. Phew! 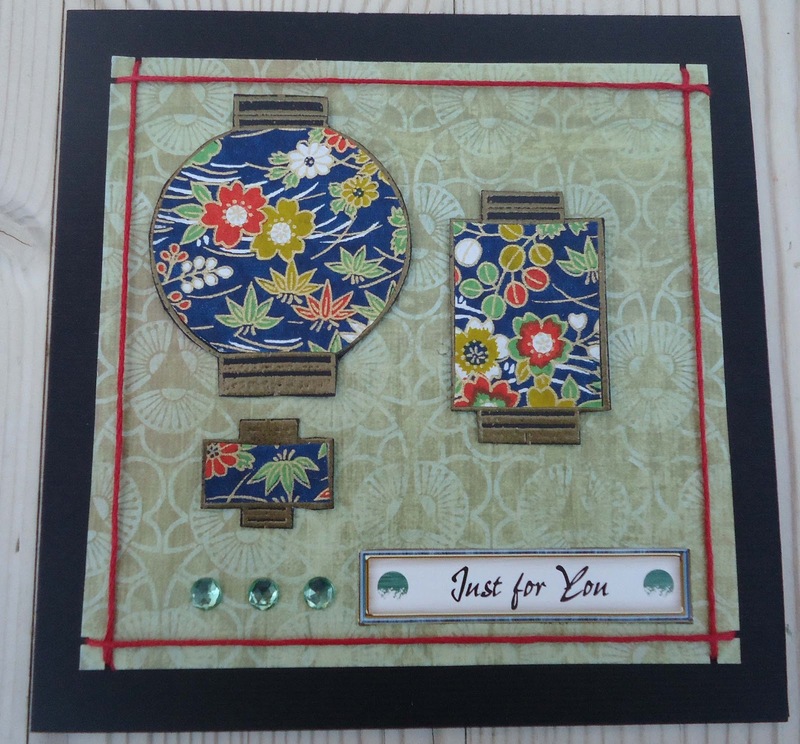 The weighing scales template I used here was free with a magazine from 2008! The original had a figure of a baby lying on it, but I didn't like it. So I cut the baby out and used this digi from Mo's Digital Pencil. 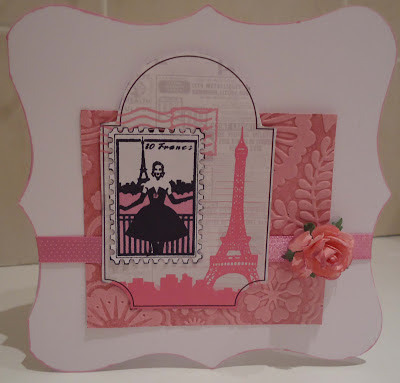 The new challenge at Make My Monday is French Vintage, and this is my attempt. 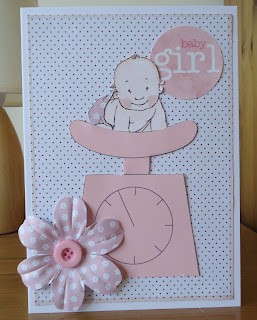 I made the central (paler pink) panel using 5 different stamps from all over the place. 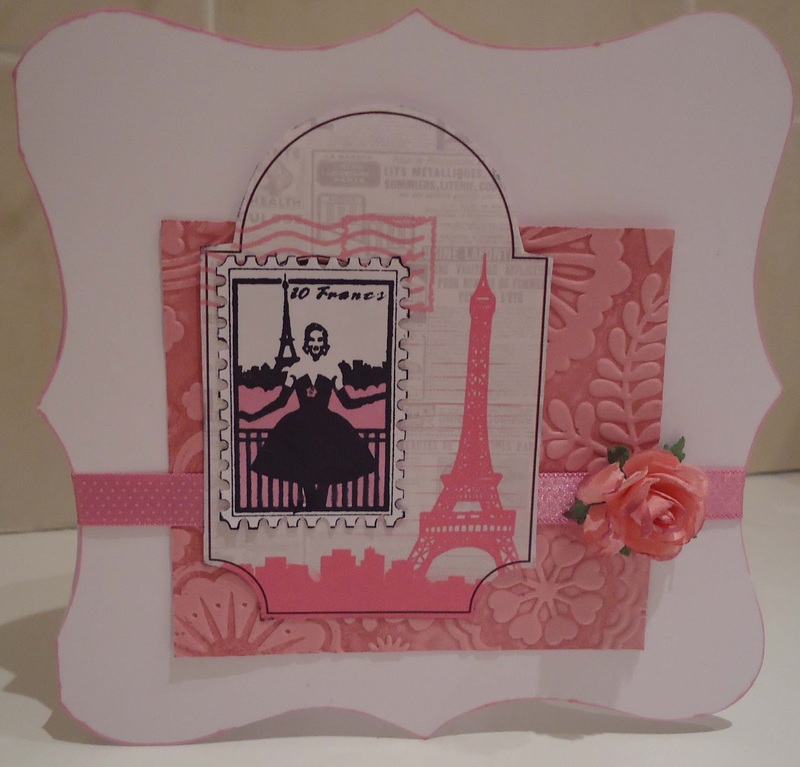 The panel at the back is resist paper from Pink Paislee Parisian Anthology. The butterfly punch is Martha Stewart, as is the lace border. 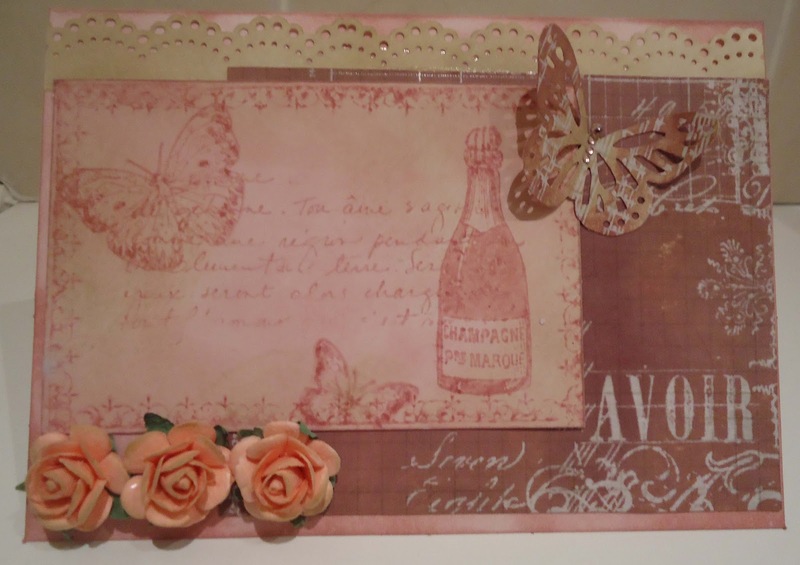 Absolutely everthing has been dabbed with different combinations of 'Victorian Velvet' and 'Old Paper' Distress inks. The Stampman Butterflies, birds and bees. 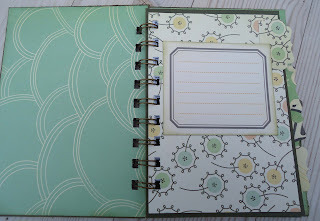 'The Order of the Opus Gluei' challenge blog has a colour challenge - turquoise and red. I thought I'd give it a go as it's not a colour combo I normally use. The houses and trees are a Memory Box die and the turquoise behind it was made with a Promarker. Things that go smudge in the night. Here's a scary story for stampers. 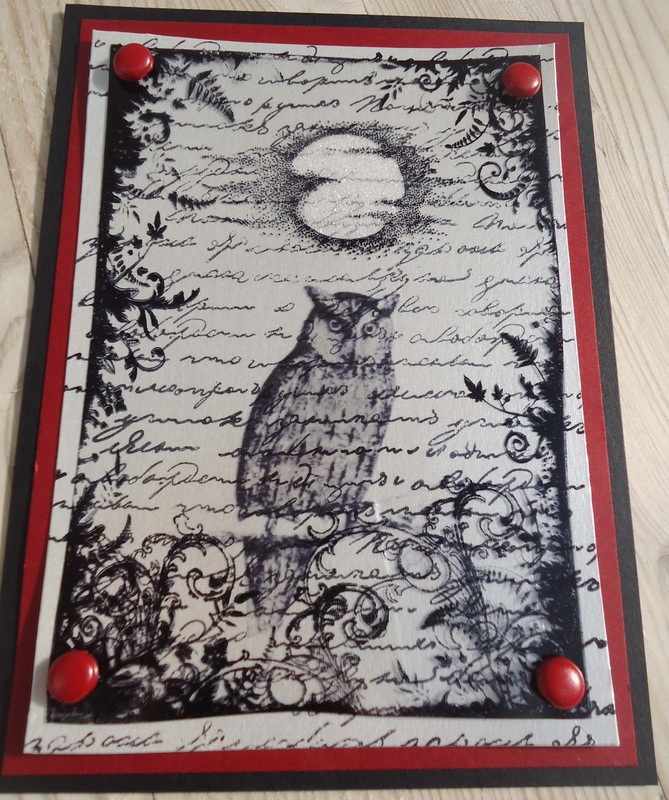 I spent ages on this card- printing and colouring the elements , some tricky paper-piecing - only to then drop the whole thing onto a still-inky stamp and get a smudge ! Top tip - adding a line of gems does not disguise a smudge! The little witches are by A Day for Daisies. The moon and bats were from a Daisy Trail digi freebie. 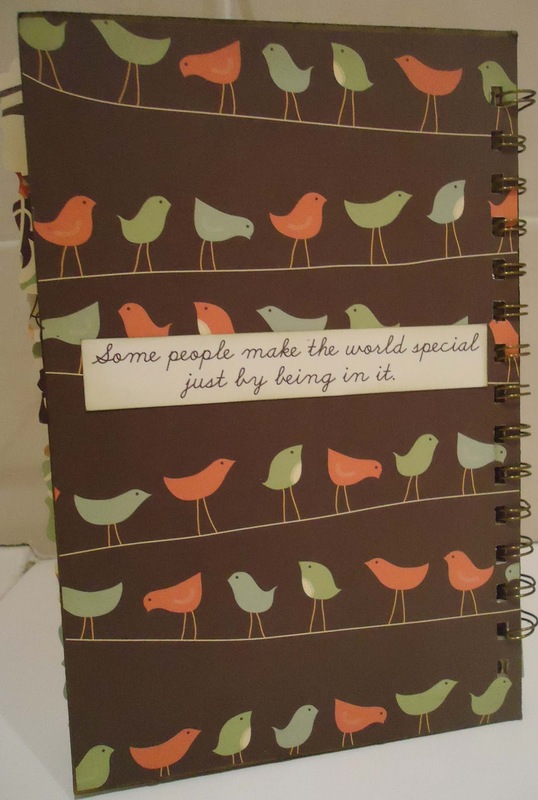 The sentiment is a Papermania stamp. You know what?- I'm going to live with it. It's for my daugter and, to be honest, she's had worse than this. I'll even go ahead and share with a few challenges. 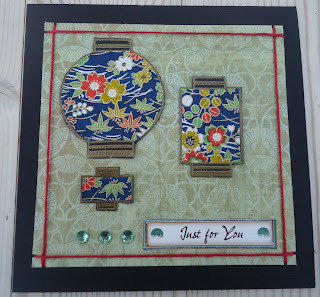 Desert Island Crafts Challenge 2,3,7,8, and accidentally- 9! This week's challenge at CD Sunday is Christmas,- which is just as well as I really need to get on with some Christmas cards! This image is from Debbi Moore's Crystal Dreams CD. I have several of her CDs but rarely use them as she has a very distinctive style and I worry I'll end up with a card that just looks a poor imitation of hers. I hope I've avoided that here! This is the first circular card I've made. 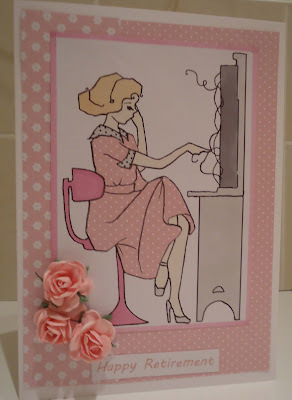 I thought they would be difficult to make but today I saw a video of Debbi Moore making one and realised what a doddle it is. I made the background with alcohol inks. The tree is an old one by PSX (now defunct) and I stamped and clear embossed it. 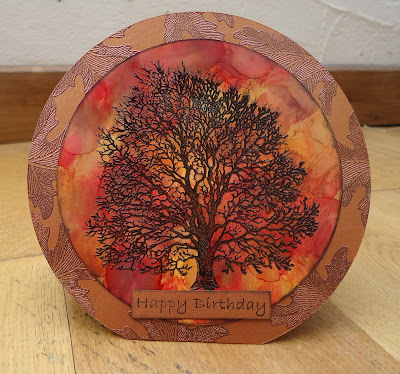 The leaf stamp on the copper coloured card is by Stampin Up and I embossed it with copper embossing powder. 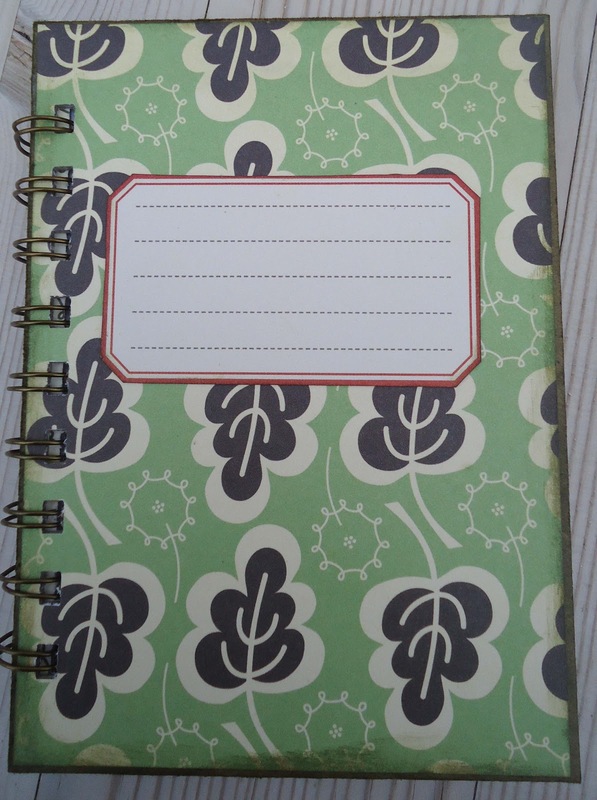 This is the same A Day for Daisies digi that I used here. This time I cropped it and had the little girl eye a little jar of tiny gingerbread men, which is a Molly Bloom clear stamp. 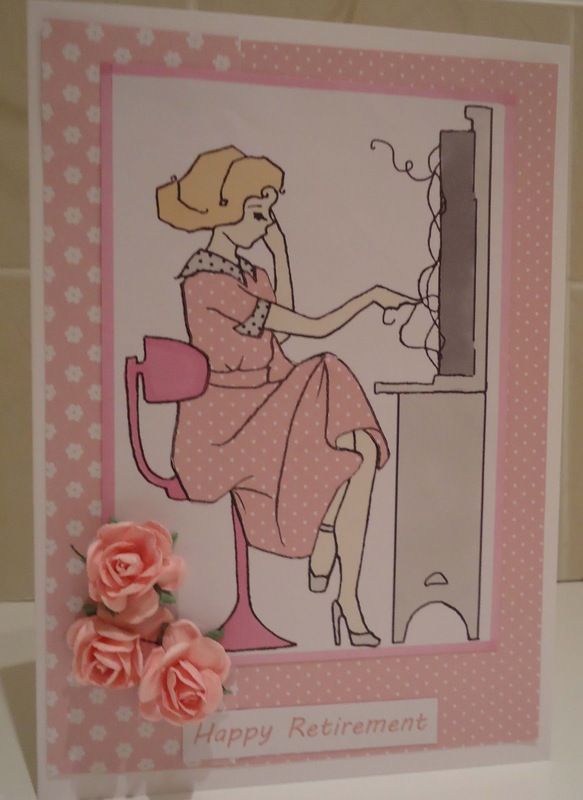 I was delighted when I spotted this A Day for Daisies image - my friend is a telephonist who is retiring next month. 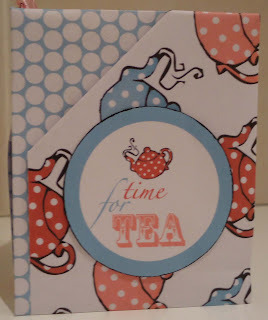 I thought this tag pocket book would be nice with an invitation to a tea party on the back of the tag. I've added a pink ribbon, which is the symbol of breast cancer awareness. All the papers, and the circular sentiment, come from Kirsty Wiseman's Colour Burst of Fanciful Things CD. Sorry for the slightly unattractive background of my bathroom tiles - it's the only room that has enough light for a photo after dark - and at this time of the year, most of my crafting happens when it's dark! 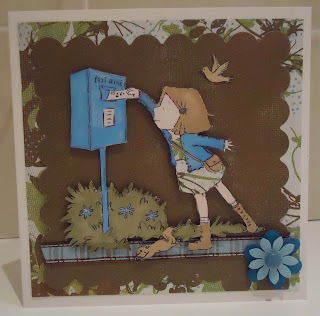 I've just been having fun playing around with distress inks and this Artistic Outpost stamp set. 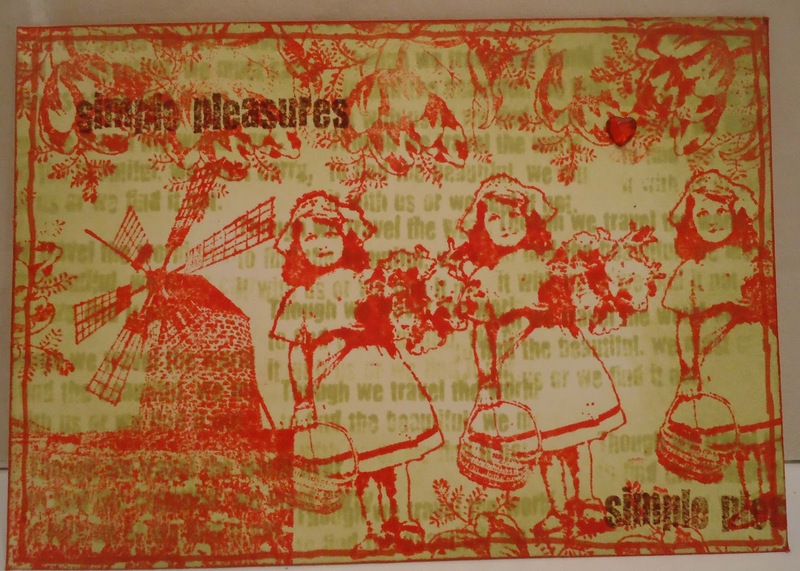 The inks I used were Shabby Shutters and Barn Door , with vintage photo for the 'simple pleasures' text. 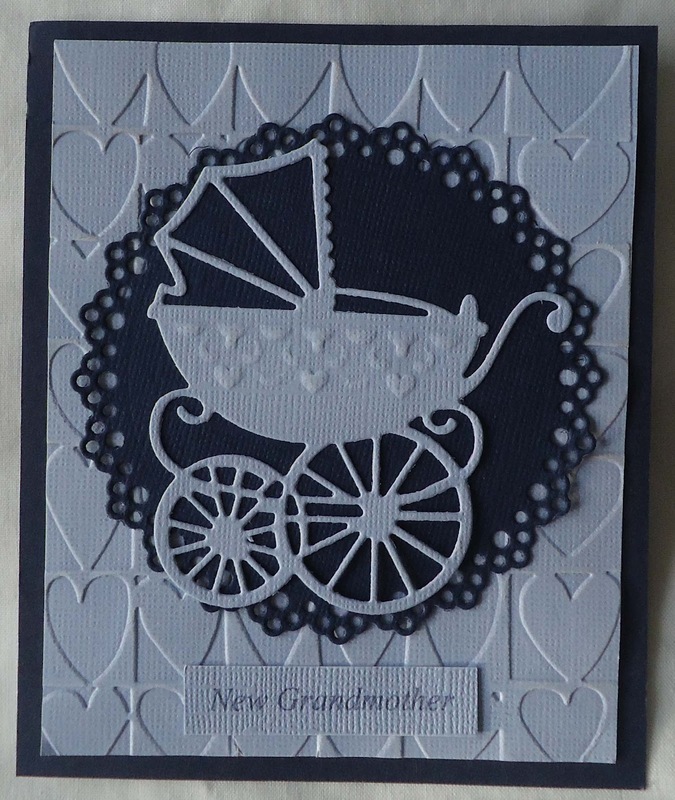 One of my colleagues at work has just had her first grandchild, so I made her this card. The blue-lilac card is Coredinations, lightly sanded. 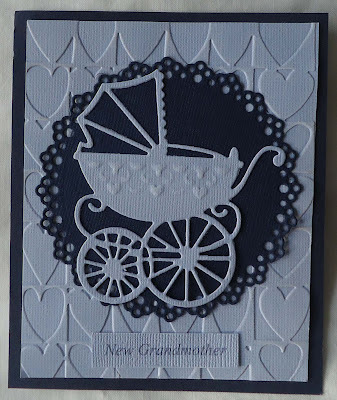 The lacy circle and the pram are Marianne dies and I used an embossing folder for the background. I printed the sentiment from my computer.